Titanium Kanpai Bottle 350M by SnowPeak by Snow Peak at Blood of The Young. MPN: 224283. Hurry! Limited time offer. Offer valid only while supplies last. Not a coffee travel mug, Snow Peak's Kanpai Bottle is a durable, titanium double-walled container that fits 12 or 16 ounce cans (dependent on size). 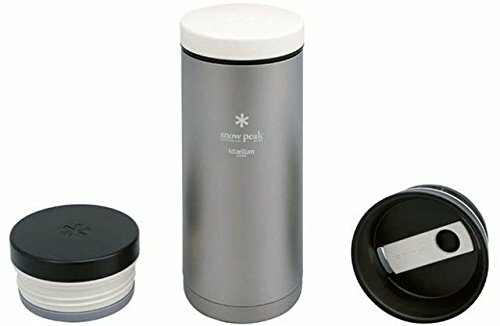 Not a coffee travel mug, Snow Peak's Kanpai Bottle is a durable, titanium double-walled container that fits 12 or 16 ounce cans (dependent on size). Each bottle is has 3 lids, one allows you to drink directly from the bottle, another is designed to keep liquids chilled up to 6 hours, and the last insulates hot drinks. If you have any questions about this product by Snow Peak, contact us by completing and submitting the form below. If you are looking for a specif part number, please include it with your message.